A meal without a dessert at the end is zero for most of the Indians. Dessert is the best part of a meal especially if it is traditional milk- based one like the all- time favorite kheer, or the rasagulla or even the halwa or the burfee. You may of course, prefer the melt in the mouth for there are more milk- based sweet varieties in India than you can count. In most parts of the world milk has always been the most important ingredient in making sweets. There are probably more varieties of milk- based sweets made in India than any other country. Just as Indian cuisine varies from north to south and east to west, sweets also varies from region to region. It is also important to note that sweets in India need not necessarily end the meal, they may even form the entire meal - in fact in many parts of India, a sweet may even be the first item on a meal. Since milk and sweets are part of all pujas in India, sweets are considered particularly auspicious. 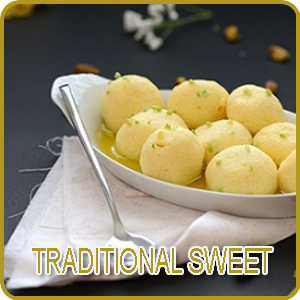 Popular milk desserts include the well known rasgullas and gulab jamuns which consists of cheese balls soaked in sugar syrup. Rasagullas remain white in color and today they are also available in tins. Though Bengal is very famous for its sweet Rasagulla it is believed to have been originated from Orissa. In Orissa this is a traditional dish and is known there as "khira Mohana" for years. In Orissa it was invented in the town of Salepur by the Kar brothers who were from the family of Bikalananda Kar, a local confectioner. 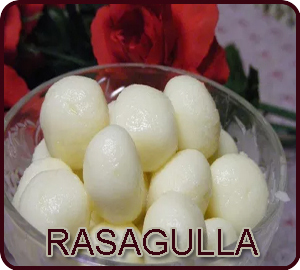 Rasagulla in Orissa is sold as Bikali Kar Rasgulla and now it is available in modified forms. But however the Rasagulla which is available now is from Bengal invented by a confectioner in Kolkata named Nobin Das who is the father of Rasagulla and he is popularly known as "Rasagolla's Columbus". Rasagulla is a traditional sweet of Bengal. Rasagulla actually traveled from Orissa to Bengal when the Brahmin cooks who belonged to Orissa were employed by the Bengali families. This is how not only rasagulas but also other delicacies from Orissa got incorporated into Bengal kitchen. The rasagulla which we eat now is not the exact recipe of Orissa but in the year 1868 Nobin Das modified the recipe as he wanted to extend the life of the sweet which was originally highly perishable. After the modification the sweet took the shape of being spongier and remained non perishable for a long time without becoming stale. So now it was very easy for Nobin Das to market the sweet, slowly the next generation K.C. Das, son of Nobin Das worked a little extra - like he canned the sweets which resulted in the widespread availability of the sweets even across the world. Rasagulla is now available in other countries like Pakistan, Bangladesh, United Kingdom and America. Though the original rasagulla comes from K.C. Das it is also prepared and marketed by some famous sweet makers from Bikaner and Delhi as well. This traditional sweet has now undergone variation like for example in Orissa the Pahala is served very hot and on the other hand in Bengal kheermohan refers to a bigger version of the rasgulla. During festival time rasagulla are also made with jaggery. Some of the other forerunners to Rasagulla include rasmalai, raskadam, chamcham, pantua, malai chop, chhena Jhili, chhena gaja, and the kheersagar. Rasagulla, the traditional food of Bengal and the first syrupy Indian cheese desert is highly nutritious where a 100gm of a rasagulla adds upto nearly 186 calories of which carbohydrate constitutes about 153 calories, fat 1.85 grams and proteins about 4 grams. The main ingredient of this syrupy sweet is chena, semolina, milk and sugar. In the coastal city of Puri in Odisha, the rasgulla has been the traditional offering to the Hindu goddess, Lakshmi, the consort of the Puri temple's main deity, Jagannath. It is a custom on the ninth day at the time of Rath Yatra or the chariot festival where rasagullas are offered to Goddess Lakshmi to conciliate her indignation for being disregarded. Only after the goddess has savored rasgullas, do the trinity of deities re-enter the temple limits after their visit. At the time of the festival rasagullas are prepared in huge quantities and are distributed to the devotees present. practice which is followed every year is known as Niladri Vijay. The origin of this tradition of offering rasagullas has been veiled in the course of time. Various scholars and distinguished historians like J. Padhi have claimed that the sweet may in fact owe its origin to the Puri temple and is believed to be more than 600 years old which is practiced right from the time of rath yatra. Another research on the religious scriptures has discovered that offering rasgullas to Lakshmi dates back to at least 300 years.Also some long established folklores of Oriya analogize Jagannath's round eyes to rasgullas. B. K. Industrial Training Centre in Cuttack named after the legendary confectioner, Bikalananda Kar is an Institute set up by the Government of Orissa in affiliation with the Jadavpur University, Kolkata. This institute mainly focuses on the revival of traditional Oriya sweet dishes and trains students in making both traditional and the latest sweet dishes of India of which Rasagulla is one main dish. The original rasagullas from Oriya used to be light cream in its hue and the traditional preparations are always served at room temperature but however the variants of rasagullas are chilled and then served. Sometimes rasagullas are available embedded with a single raisin or cashew and also a cardamom seed inside each sweet which enhances the fragrance and also the outer appeal. In northern India, the dish comes flavored in saffron, rosewater, and sometimes garnished with chopped pistachios. Rasagulla is a trinity of chhena desserts when it comes along with chhena gaja and chhena poda. Rasagulla with a variety of other chhena dishes like sondesh and a few more are collectively known as Bengali sweets. When orange extract is added along with chhena then the sweet is known as Kamalabhog. In the dish kheersagar, thick, sweetened milk called rabidi is used instead of sugar syrup. While this dish is largely confined to Odisha, a similar dish, rasmalai has become very popular throughout India, mainly due to the efforts of the Kolkata based confectioners K. C. Das, Ganguram and Bhim Nag. The difference of rasamalai with rasagulla is that the syrup in rasamalai is replaced with sweetened milk of a thinner consistency. Even though the recipe of both Rasagulla and the Chhana is not exclusive to the Bengalis and have been imported, it can be really heart-crabbing for it takes away the entire bequest of Bengal in sweet making. The most common ancient practice of serving rasagulla is at room temperature but nowadays it is also served chilled or sizzling hot which is directly from the kitchen. Rasagullas are also frozen to be eaten along with ice creams and the most notable among them is the Notun Gurer Rasguulla Ice-cream from the popular Bengali restaurant at 6 , Ballygunge Place. There is an outlet in Bangalore as well. 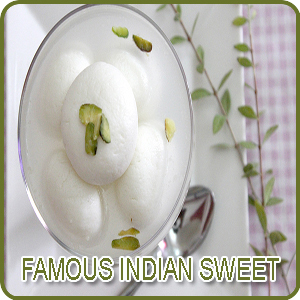 This famous Indian sweet is mainly made of Paneer or the Indian cottage cheese and is very to easy to prepare. The most common ingredients required in preparing rasagullas include Milk or full cream milk, lemon juice in very small quantity, Sugar, Water, maida or the all- purpose flour, pinch of cardamom powder. The main item required in the preparation of rasagulla is soft paneer. Paneer is made by boiling milk in heavy bottomed pan and when the milk comes to boil the stove is simmered and then lemon juice is added. Once the lemon is added the milk starts curdling. The milk has to be stirred continuously until the milk solids separate from the whey. Then it is strained in a muslin cloth after which the paneer is washed under cold water so that the flavour of the lemon is removed. The muslin cloth is squeezed and then hung for at least 45 minute so as to remove the excess water from the paneer. The resulting paneer is soft and crumbled. Now coming to the actual preparation of rasagulla the paneer is well kneaded by adding maida and sugar so that soft and supple dough is got. The quality of rasgulla is much softer when the kneading time is increased. Once the dough is ready they are made into small smooth balls without cracks. Simultaneously the sugar syrup is also prepared where water, sugar and cardamom are boiled in a big vessel. When the sugar syrup is boiling drop the balls into it and cook it in high flame for at least 5-6 minutes with the lid closed. After this the lid is opened and 2-3 tbsp of the Maida water is added and cooked for another 5 more minutes. Now again add 2 tbsp of plain hot water to the boiling syrup. The main reason behind adding hot water at regular interval of time is to prevent the sugar syrup from becoming thick. The main indication which confirms that the rasagullas are cooked is that when the sweet balls are pressed it should return back to its original shape. Now it is let down to cool and garnished with almonds and pistachio and other flavouring agents according to the individuals' need. If it has to be served later then it is refrigerated for at least 3 hours.